Low-speed aerodynamics is important in the design and operation of aircraft flying at low Mach number, and ground and marine vehicles. 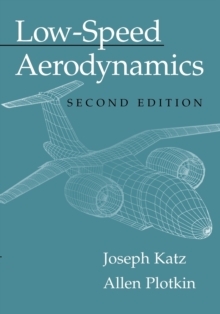 This 2001 book offers a modern treatment of the subject, both the theory of inviscid, incompressible, and irrotational aerodynamics and the computational techniques now available to solve complex problems. A unique feature of the text is that the computational approach (from a single vortex element to a three-dimensional panel formulation) is interwoven throughout. Thus, the reader can learn about classical methods of the past, while also learning how to use numerical methods to solve real-world aerodynamic problems. This second edition has a new chapter on the laminar boundary layer (emphasis on the viscous-inviscid coupling), the latest versions of computational techniques, and additional coverage of interaction problems. It includes a systematic treatment of two-dimensional panel methods and a detailed presentation of computational techniques for three-dimensional and unsteady flows. With extensive illustrations and examples, this book will be useful for senior and beginning graduate-level courses, as well as a helpful reference tool for practising engineers.